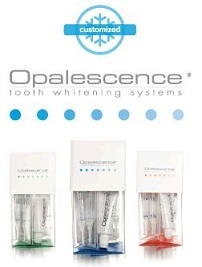 We are proud to offer our patients the Opalescence Tooth Whitening System. This system allows you to whiten your teeth at your convenience – in a safe, effective and customized way. We start out by creating custom bleaching trays by taking an alginate impression of your mouth; this customization is part of why this system is so effective. With your trays, we also dispense prescription-strength whitening gel in 10%, 15%, 20% or 35% carbamide peroxide depending on your treatment needs and desires. The sticky, viscous gel does not migrate to your gums, and all our formulas include Potassium Fluoride, which helps improve overall oral health by strengthening enamel and decreasing sensitivity. Our system can provide results after just one night, though you should expect to get full results in about two weeks. Call us today for more information about this great whitening system.